Cross stitch pattern from Cuore E Batticuore. Look at this fun, Spring design to stitch! Sunflowers are blooming everywhere! A small house is stitched in the bottom middle, with a planter of blooming sunflowers to the left. On the right side of the house, a woman is planting sunflower seeds. Bees are loving the sunflowers. 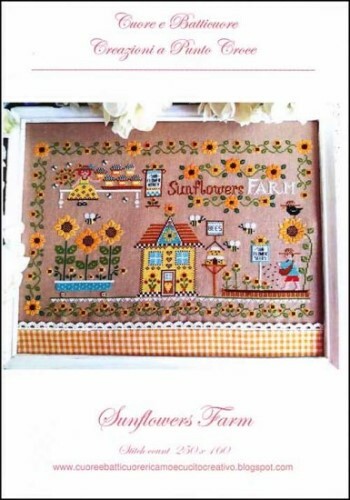 "Sunflowers Farm," is stitched in the upper right corner. A sunflower border is stitched around this design to complete it. Stitch count 250 x 160. Stitched on Zweigart Belfast Linen Light Mocha 32ct.